Call us or sign up here for everything you need. A new career is closer than you think! 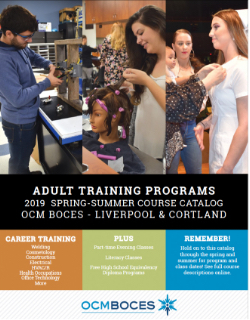 OCM BOCES offers a range of full-time career training programs in areas ranging from health occupations to office technology to construction and other trades. It all starts by attending an informational Open House — just stop by at 1 p.m. any Thursday at both our Liverpool and Cortland campuses. From there, you’re just a few steps away from the career you deserve. You can also check out our current course catalogs or click on the links below for program and class dates. Don't have your high school diploma? We have programs that can help with that too! A variety of options are available, call 315-453-4672 for more information.